Great item to add to any collection. Overall, the game is in very good condition. Considering its age, the box is in very good condition with the exception of the red paint on the front panel. 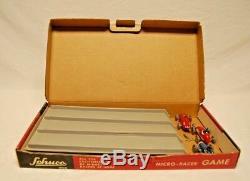 According to box, contents includes 2 Spring-Driven Micro-Racers, 10 Units 3 Lane Track & Automated Finish Line. 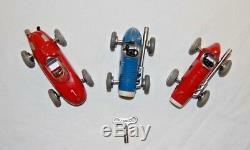 3 Micro-Racers, Nos 1037, 1040 & 1042 (made in Western / US Zone Germany). I believe the 1040 & 1042 actually came with the game. The 1037 Porsche was in the box when I found it. 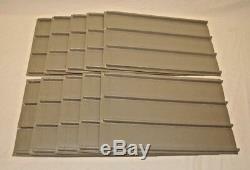 10 Track Sections Embossed Made in USA. Finishing Line (Missing one post). Minimal play wear with a few incidental nicks/rub marks in finish that you would expect to find on the racers. They measure between 3 and 4 inches long. Wind Up mechanisms work perfect. Remove key, release brakes and watch them roll! Track sections measure approximately 14 long by 9 wide. A couple of them have minor cracks and stress marks in the plastic. Ive included photo copies of the Finishing Line components that I printed on heavier card stock that can cut out and used if desired. PLEASE REVIEW PHOTOS CAREFULLY AS THEY SHOW THE DETAIL MUCH BETTER THAN I CAN DESCRIBE. Please check out my other listings. 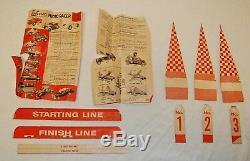 The item "Vintage 1962 SCHUCO MICRO RACER GAME No. 1000 With 3 Cars" is in sale since Wednesday, December 26, 2018. This item is in the category "Toys & Hobbies\Vintage & Antique Toys\Wind-up Toys". The seller is "peatmoss_01" and is located in Finleyville, Pennsylvania. This item can be shipped to United States, Canada, United Kingdom, Denmark, Romania, Slovakia, Bulgaria, Czech republic, Finland, Hungary, Latvia, Lithuania, Malta, Estonia, Australia, Greece, Portugal, Cyprus, Slovenia, Japan, China, Sweden, South Korea, Indonesia, Taiwan, Thailand, Belgium, France, Hong Kong, Ireland, Netherlands, Poland, Spain, Italy, Germany, Austria, Bahamas, Israel, Mexico, New Zealand, Philippines, Singapore, Switzerland, Norway, Saudi arabia, Ukraine, United arab emirates, Qatar, Kuwait, Bahrain, Croatia, Malaysia, Chile, Colombia, Costa rica, Panama, Trinidad and tobago, Guatemala, Honduras, Jamaica.